BT Assistant (Mathematics)- 2 Posts ( 1 - MBC/DNC, 1-BC other than Muslim), Qualification : BSC Mathematics & B.Ed with Teacher's Eligibility Test (TET). 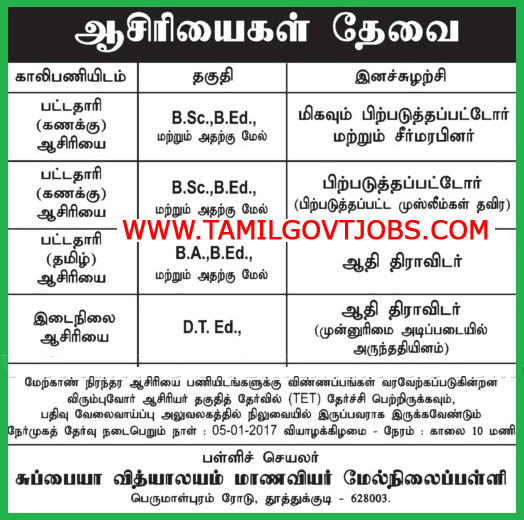 BT Assistant (Tamil)- 1 Post for SC Quota, Qualification : BA Tamil & B.Ed with Teacher's Eligibility Test (TET). Primary Teacher - 1 Post in SC Quota , Qualification: 12th, Diploma in Elementary/Teacher's Education, Teacher's Eligibility Test (TET).